YouTube and other drumming blogs are awash with posts recommending that we try to displace the metronome - i.e. make the click feel as though it is on a part of the beat other than the downbeat - as a way of strengthening our awareness of musical time. I’m totally for this idea, but the one thing usually left out of these posts is exactly how one goes about doing that. To feel the metronome on the downbeat is quite natural. Most people, musician or otherwise, can feel a beat and tap their foot along with it. Even feeling the metronome on the upbeats isn’t too terribly difficult for most. I’ve been able to have pretty young students feel the metronome as “&” simply by having them click their sticks or clap their hands on what they initially feel as the upbeat and then start counting “ONE, TWO, THREE, FOUR” out loud on those beats. But from there things get significantly more difficult. Even when I was already a somewhat decent player, probably in music college sometime, I tried this idea by attempting to feel the metronome as “e”, and found it difficult at first. I had to teach myself how to feel the metronome there. If you’re simply struggling to get started but can then keep your ear tuned in on the metronome as “e”, the easiest approach is to simply listen to a few clicks of the metronome to find the tempo, turn the metronome off, start counting “one, e, &, a….” at that tempo and then hit start on the “e”. Chances are your ears will grab it right away. 1. Turn your metronome on at a reasonably slow tempo, maybe in the 60 bpm range, and simply feel it wherever you naturally feel it, which will probably be the downbeat. In these examples the arrow will represent the metronome clicks. 2. Start playing steady 16th notes with no articulation. Start with your weaker hand which is more likely to play on the “e” under normal circumstances. 4. Now, play accents with the metronome click while still counting “e, &, a 1” out loud. Again, this should be your weak hand. 5. Then, accent the note where you are saying “One”. ...which is identical to the previous example, but hopefully your mind’s ear has flipped it over so that the metronome now feels like “e” instead of you just saying it. 7. If this concept is new to you it might be difficult to continue playing accents on “1” with the metronome on “e”. If this is the case play it for one bar and then switch to accents on “e” for a bar which is a little bit easier to stick with. *play the accents on each of the various 16th notes with the metronome still on "e". If you'd like all of the examples above on a single sheet, please e-mail me for a PDF. Celebrity culture is such a funny thing. It's strange that people who we've never met can have such an impact on our lives. But they can, and they do. I've written before about musicians we've lost who have had an impact on me. Anthony Bourdain, though not a musician (that I know of), has had a similar impact on me. 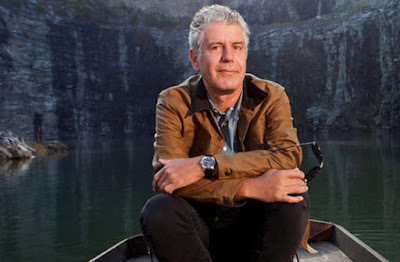 I discovered Bourdain sometime around 2008 when I really started traveling a lot, and he quickly became my go to guy. His show got me excited for trips, gave me ideas for where I was going, and the inspiration to visit other places. I remember reading some of his books, both fiction and non-fiction, and watching episodes of his shows while on said travels, and I've had some truly wonderful meals and memorable days out based on his recommendations. Pretty much any time I go somewhere new I tend to Google "Anthony Bourdain (insert city here)"
One Bourdain quote sticks out to me clear as day. I remember watching the episode and hearing this epilogue as the credits rolled and relating to it so much. Anthony Bourdain was one of those guys I had always hoped to sit down and have a beer with. I hope that whatever it was that he was struggling with isn't weighing on him any longer and that his family are holding up. If you ever have the opportunity to travel anywhere (through music or otherwise) I hope you jump at the chance. And if you're looking for something to do, or somewhere to eat, simply search for the place you're in and follow it with Anthony Bourdain. © 2013 Adam Osmianski. Simple theme. Powered by Blogger.